It’s been forever since I’ve written a blog entry, so LETS DO THIS. I want to talk about reading RFID tags with Ruby. I am a nerd, so even though I can’t think of a good application, I am compelled to be able to read RFID tags. I love programming Ruby, so of course, I have to do this with Ruby. First thing to do, is buy an RFID reader. After searching around, I found the touchatag reader. I bought the touchatag starter pack. It’s only $40, USB, and comes with 10 RFID tags. Most importantly, it works well with libnfc (more about that later). The tags that come with the reader have an adhesive back, so you can stick them to stuff. They also have the unique identifier printed on them so that you can make sure your program output is correct. Now that we’ve got the reader, let’s do something with it! 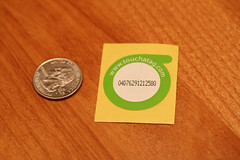 I mentioned earlier that the touchatag reader works with libnfc. Libnfc is a C library that knows how to work with NFC devices (nerd talk for “RFID readers”). I’ve written a gem called nfc that wraps up the C library in to something we can use in Ruby. Installing on linux should be just as easy, but you’ll need to consult your package manager. Make sure to install the devel packages too! That’s pretty much it. Unfortunately, I can’t think of anything fun to do with my tags, but maybe you can! I hooked my tags up to the “say” command that comes with OS X and made each tag say something different. Our previous example blocked until an RFID tag was read. If you run the program without having an RFID tag on the reader, it will just sit there until it can read a tag. Sometimes we might want to tell whether or not there is a tag on the reader right now. In other words, we don’t want our program to block. That’s pretty much it. 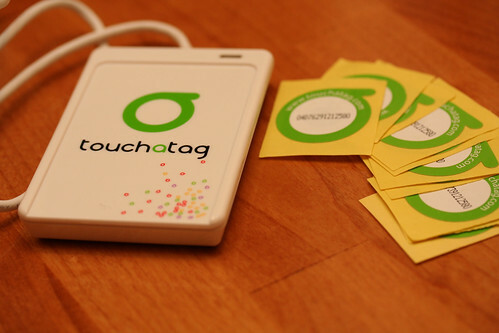 Interacting with the touchatag reader is quite simple and straight forward. Currently the nfc gem supports reading ISO1443A tags (the tags that come with the reader). The reader should be able to read other tag types, but I haven’t had a chance to get other tags to test. Touchatag provides an official API for their readers. But the API seems difficult and is dependent on a network connection. Here is a video of me reading some tags. Here is the code from the video. Here you can find more photos of the reader. Finally, here is the source of the NFC gem. Have fun reading some RFID tags!